Plant taxonomy classifies sweet autumn clematis as Clematis terniflora. In this case, the genus name is so commonly used to refer to the plant in question that it essentially doubles as a common name; in such cases, the first letter is not capitalized. C. terniflora is a deciduous, perennial, flowering vine. A climber that can tower 30 feet high or so (more commonly 15 feet), sweet autumn clematis makes a strong statement when it blooms in the fall landscape. This twining vine's flowers are small, white, numerous, and fragrant. When covering wood fences or similar structures, a sweet autumn clematis in bloom gives the appearance of a great fleece. In fact, if "fleeceflower" had not already been taken by another plant, the name would have served this vine well. The leaves are dark green. The spent flowers are replaced by fuzzy seed heads that are also attractive. C. terniflora is native to Japan and can be grown in USDA planting zones 4 to 9. Plant these vines in full sun for best flowering. But they are also vines that will tolerate shade, as long as you are willing to put up with reduced flowering. The plant is not fussy about soil, as long as it is well-drained. This vine blooms on the current year's growth. Prune it in early spring. Most people cut the plant down to within a foot or so of the ground. But if you wished to give your vines a "head start" to cover a large pergola, for instance, you could prune less severely (that is, leave more of the old vines in place). 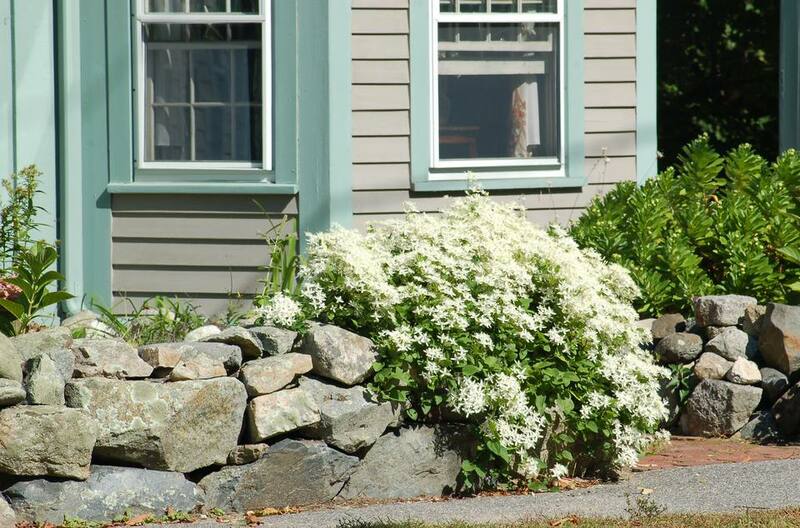 Because sweet autumn clematis vines can be invasive plants, it is recommended that you consider alternatives. Virgin's bower (C. virginiana) is a native alternative for Eastern North America. If you do not mind switching from numerous, small, white flowers to fewer, but larger ones that are pink or purple in color, simply grow any of the popular non-invasive types on the market, such as 'Jackmanii,' 'Doctor Ruppel,' and 'The President'. These three alternatives, however, are smaller (shorter) vines, so do not expect them to cover large eyesores as fully as sweet autumn clematis does. Your first impression of this advice may be negative, in that you are being asked to give up a beautiful flowering display in exchange for an alternative that, in some ways, is less impressive. But there is substantial landscape maintenance work that this decision might be saving you for years to come, so it may be a blessing to stay away from growing this self-seeding vine. The plant puts out masses of seeds, and you will be yanking out its stray seedlings year after year. These unwanted seedlings pop up in the unlikeliest of places, such as in the middle of a shrub hedge, where they can go undetected unless you are on the lookout for them. C. armandii: 10 to 12 feet tall; zones 6 to 9; evergreen. C. recta 'Purpurea': 4 to 8 feet tall; zones 3 to 9; non-climbing Clematis; cultivar name comes from purple color of the new leaves; fragrant; species plant has proven invasive, but not the cultivar. C. 'Henryi': 10 to 12 feet tall; zones 4 to 9; large flowers. C. 'Fragrant Star': 6 to 8 feet tall; zones 4 to 9; large flowers; fragrant. C. flammula: 10 to 15 feet tall; zones 4 to 9; fragrant. Bloom time is late summer to early fall, when many other perennials are done blooming for the year, making C. terniflora a popular choice for the four season landscape, in spite of its invasive nature. Although it can be used as a ground cover, the plant is more commonly found draped over stone walls or scaling structures such as arbors. A well-situated arbor smothered with a blooming sweet autumn clematis vine in fall can certainly serve as a focal point in the landscape. The vine's white flowers make it effective in moon gardens. The ancient Greek klema (twig, branch) is the source for the word, "clematis." The species name, terniflora is a Latin word meaning three-flowered. This is, however, a misnomer, because a flowering stem on this vine can contain more than three blooms.